Eventually, we should move away from expressways inside the city limits and toward arterials with a higher speed limit than 30 mph. Concerns about traffic flow and commute time could be alleviated by yet another long overdue change. The power elites who have run Buffalo into the ground for decades have largely squandered the greatest inland waterfront in the United States, ours. Only in recent years has progress been made. It is said that China builds the equivalent of a new city every month or so and we are supposed to genuflect because the politicians built one skating rink in fifty years. No honest observer can deny that the small circle of people who have run Buffalo for the last 60-70 years have, by and large, been lacking in any real talent other than lining their own pockets, staying in power and crushing potential adversaries. It is generally agreed that, at every major fork in the road of development, they took the wrong turn. 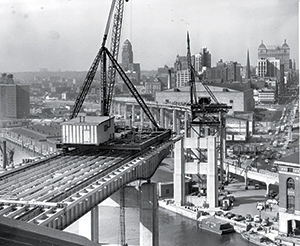 The Skyway, under construction, in 1955. We can’t change the past, but the power elite’s mistakes are all around us and all of them can be corrected if we have the will, the grit and the determination. I repeat myself there because those qualities are sorely lacking in the political class. Keep in mind these folks joined the political class in the first place because they know deep down they could not cut it in the marketplace. They are absolutely terrified of any real meritocracy. That said, let’s get into it. Mr. Cuomo, tear down that Skyway! It’s an atrocity crushing every other good thing that has been belatedly done on the waterfront. And don’t wait ten years to do it. Get rid of it, now! Call the Marines and Holly-wood. Have the Marines do an emergency demolition as a training exercise while Hollywood films the action for a movie. Have the Corps of Engineers put up a temporary bridge over the river. Then announce a worldwide competition to see which engineering firm can build a bridge in Guinness Book of Records time. Next, fill in the 33 and re-create the old and glorious Humboldt Park-way. (A parkway is a broad thoroughfare with plenty of green space. See, for example, Bidwell Parkway.) 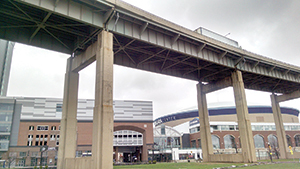 The 33 (Kensington Expressway) is a stake through the heart of Buffalo. Recreating the old Parkway would be one of the greatest economic development moves in the last 100 years in Buffalo. Why? The 33 is surrounded by old, decaying neighbor-hoods. Obviously, thanks to 100 years of the catastrophic failure of numerous progressive programs from the New Deal to the Great Society, a once-vibrant inner-city is moribund in any sphere of activity not subsidized by taxes. Has any new home been built on the East Side in fifty years that was not subsidized by the government? Somehow, the free market though, before all these failed progressive programs, was able to build an amazing housing stock! Stand along the waterfront under the Skyway and get a novel auditory experience. The Parkway would have an immediate impact on this mess the progressives created. I estimate that a well-designed new Parkway with a bike path would quickly add $10,000 in value to each home within a half mile, many thousands of homes! This in turn would stimulate renovations and updates as a natural reaction to suddenly being near a major recreational and aesthetic attraction. The project to convert the 198 into a parkway where it passes through Delaware Park should continue. This should have been done long ago. It took a tragic car accident to move the bureaucracy. It is unfortunate, however, that the political class took the opportunity to turn the rest of the 198, still an expressway, into a portable tax collection zone by absurdly reducing the speed limit to 30 for no particular reason. I wouldn’t lose any sleep if the whole 198 was eliminated, but let’s a have a realistic speed limit until that happens. It’s funny. You can spot the real true-believing progressives. They are the only ones going 30 past the park. How are we going to get to the Airport without the 33? Easy. Turn Genesee Street into an arterial. It’s a wide enough and with the proper traffic signals, about which more later, it could take folks from Down-town to the Airport quickly enough. Or, the 190 remains as an option. In the long-term, perhaps a rail line would be feasible but it would have to be market driven. Genesee, like much of Buffalo, is a dead zone. With increased traffic flow, businesses would have an incentive to locate there to service the new traffic. This could include gas stations and diners and small shops. Does anyone have a better idea for rejuvenating Genesee Street? 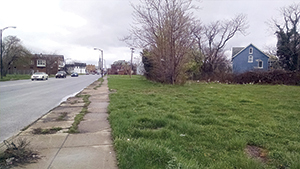 Largely vacant and underdeveloped Genesee St. could become a bustling arterial if the 33 was removed. Eventually, we should move away from expressways inside the city limits and toward arterials with a higher speed limit than 30 mph. Concerns about traffic flow and commute time could be alleviated by yet another long overdue change. Instead of the ancient technology of the on-and-off switch, that is, the traffic light, we need to finally move into the 20th century; yes I mean using last century’s technology and joining the digital age of traffic control. Bring in Microsoft or Google and ask them to install as a pilot project smart digital traffic controls that change the signals based on actual traffic in real time. The technology exists, use it. Not only would this mean that people could move around Buffalo very quickly and without the monstrous expressways that destroyed so many parks, parkways and neighborhoods, but allowing drivers to move around in a rational way, based on traffic, rather than ancient and arbitrary traffic signals, would most likely reduce accidents and road rage incidents, caused by the frustration of being stuck at light after light for no actual reason other than bureaucrats have been too lazy to change traffic control methods for 100 years. This isn’t the time to explain in detail why the waterfront was wasted for fifty years and why so many major mistakes about land use and transportation have been made. I have written about this elsewhere. Socialism and bureaucracy don’t work on a large scale as we have seen in many countries, and, the islands of socialism and bureaucracy we have in the United States don’t work either. For fifty years, a state bureaucracy ultimately controlled by Albany and New York, did nothing with the water-front because they lacked the market incentive to do so. The brilliant solution to this problem conjured up by the local political class was to create yet another state authority, the Erie Canal Harbor Development Corpora-tion, also controlled by Albany and New York City, contrary to what we were told when it was created. Noise pollution reigns supreme under the Skyway. When bureaucrats and politicians control development decisions, since they lack market signals and incentives, they tend to necessarily default to making decisions based on self-interest, connections and cronyism. To make matters worse, the corrupt projects and deals will proceed slowly. It takes ten years to do projects that the free market could do in a few months. There is little hope that this corrupt system will be swept aside anytime soon. On the contrary. The power elite in Buffalo never had it so good. They have no organized opposition at the moment other than the threat of indictment by a naïve prosecutor from Manhattan who thinks he can single-handedly make a bad system work better. Just another deluded progressive. In the meantime, though, as we have seen, sometimes pure emotion and outrage can carry the day. So, I invite you to stand underneath the Sky-way this weekend, hear the roar of the traffic, see the wasted real estate, notice the architectural dissonance of a colossal bridge smothering a potentially beautiful waterfront and get mad as hell! Common sense and logic, the 2 qualities missing from government. China builds the equivalent of a new city every month and in doing so completely destroyed the housing market and have created numerous empty ghost cities. The cities that arent hurt by this are cities that are established major population centers that do not renovate, the just tear down the old and build up the new. Buffalo does not have the population to sustain this trend nor do the citizens of Buffalo go through apartments like chinese do. So its unfair to chastise prior regimes (power elite, as you will) for not building property when we cant even fill the buildings we have.